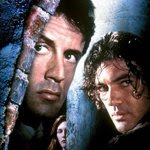 I am in a quandary as to why, when you have two charismatic leads like Sylvester Stallone and Antonio Banderas, you would not imbue their characters with one single likable trait. Richard Donner who has made quite a few big budget crowd pleasers – Superman: The Movie, Lethal Weapon, Maverick, Sixteen Blocks, just to name a few – seems to have let go of the reigns here. The film opens with black and white footage of a Tashlinkov, a Russian assassin, collecting money from a bank in South America. Waiting and watching from a window in a building across the road from the bank is another assassin, Robert Rath (Sylvester Stallone). As Tashlinkov leaves the bank, Rath makes the shot and kills his target. In the process, Rath has moved for being the world’s No.2 assassin, to No. 1. The film moves forward many years to present day, and Rath marches a fellow into a swamp to be killed. You can tell that the years have taken their tole, and Rath is jaded by the whole killing business. When the target pleads for an honorable death, Rath hands him a gun with only one bullet in it. The target takes his own life. Rath’s mission is complete, but he is his life and the world he inhabit. This is further emphasized in the next scene, in a moment of moody introspection. Rath stares out a window as rain falls outside. Later Rath has to go back to work. Via computer, he contacts he controller and is given his next assignment. His target is Alan Branch, who is a billionaire who has been financing right-wing death-squads in South America. Branch who is a recluse, comes out of hiding to attend his brother’s funeral. Rath also attends the funeral as a mourner, with a gun hidden in a fake plaster cast over his arm. He intends to make the hit; collect a big payday, and then retire from the business. Unbeknownst to Rath, another assassin, Miguel Bain (Antonio Banderas) has also been hired to make the hit on Branch. As the priest performs the ceremony, hiding behind a gravestone, Bain takes the shot and kills Branch. Rath is confused; and most importantly dismayed that his payday has been taken away from him. It appears that Rath’s position as the No.1 assassin is under threat. Bain is No. 2 and he wants the top job. Naturally the two men will battle it out throughout the film to see who is the best. Rath’s next assignment is to take out a woman known as ‘Elektra’ (Julianne Moore). Elektra is a hi-tech cyber thief with secrets to sell. Her buyers are members of the Dutch underworld. Rath also has to kill the buyers and retrieve the information that Elektra is selling. Naturally, as the assignment plays out, Bain becomes involved and it becomes one great big shooting match. Assassins features violent an unpleasant characters who have little concern for civilian casualties. Sure the film has plenty of action and if all you’re after is loud action set pieces, then maybe the film qualifies as a solid slice of entertainment. But those who want a little bit more, like characters who are worth investing your precious time with, will find that you just don’t care about Stallone or Banderas at all. Ultimately this film is loud and empty.